These are heavy duty construction & performance of these Presses. 'SANTEC' manufacture these Presses with an uncompromising Quality attitude & providing outstanding services world wide. SANTEC Engineer's are Competent enough to accommodate customer's suggestions & design the presses meeting all requirements as per International standards. In these presses, the Ram / slide / moving platen moves in upward direction (from Bottom Home Position to upward position). We have standard models & make these presses as per customer's specifications & requirement too. In the present business scenario, its a fight for existence and the company with the most viable business plan & stratregies survive in the corporate world. 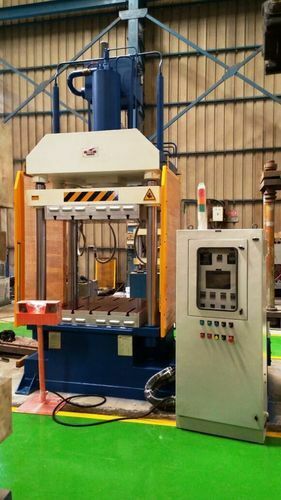 Santec, guided by hardwork, sincerity and a determination to excel, has emerged as one of the largest & leading Manufacturers and Exporters of hydraulic presses, power compacting presses, H type presses, h type power compacting presses & other machinery. Reputed as one of the fastest growing companies in India, it is widely recognized not just for excellence in workmanship, materials and finish but also for technical aspects of its product.